The effects of natural disasters and climate change vary widely by state, county, and community. Although social variables such as income and age do not determine who will be hit by a natural disaster, they do determine a population's ability to prepare, respond, and recover when disaster does strike. 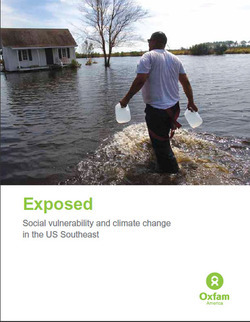 Historically, studies about climate hazards and social vulnerability have been conducted in separate silos. The Social Vulnerability Index (SoVI) is the first study of its kind to examine both the potential impact of natural hazards and which populations are most likely to be negatively affected. The SoVI statistically examines the underlying social and demographic characteristics of the population and how they impact certain segments of the population in disabling ways when it comes to climate change-related hazards. This research, commissioned by Oxfam America, includes a series of layered maps that depict social and climate change-related hazard vulnerability. 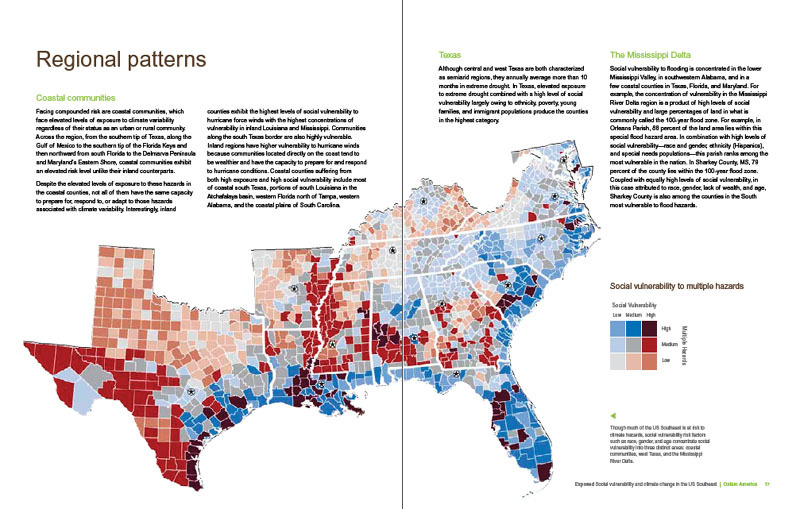 The maps assist in identifying hotspots in the US Southeast, which are at significant risk in the face of four particular climate change-related hazards: drought, flooding, hurricane force winds, and sea-level rise. The specific region of focus is the 13-state region of the US Southeast: Alabama, Arkansas, Florida, Georgia, Kentucky, Louisiana, Maryland, Mississippi, North Carolina, South Carolina, Tennessee, Texas, and Virginia. Roughly 80 percent of all US counties that experience persistent poverty (defined as a county in which at least 20 percent of the population experiences poverty for three decades or more) lie in this region. For more details and to view interactive maps, visit oxfamamerica.org/adapt. "